Linlithgow Combination comprised the eight parishes of Abercorn, Bathgate, Bo'ness, Carriden, Kirkliston, Linlithgow, Muiravonside and Whitburn. Carriden later withrew from the Combination. The total population of the member parishes in 1881 was 35,621. Linlithgow Combination dates from 1851 when its parishes met to discuss the possibility of setting up a joint poorhouse. At that time, about 500 of its then population of 16,000 were destitute. It took until July 1854 for the project finally to authorise construction work to begin at a site on rising ground on the eastern outskirts of Linlithgow. The building was completed in 1856 by which time the total cost of the land, building and furnishing was in the region of £9,000. The first Governor and Matron were Mr and Mrs John Peddie who were employed at a joint salary of £80. The sandstone building comprised a large rectangular main block, mostly of two storeys but with a three storey central portion. Located at the centre would have been the Governor's quarters, a committee room, offices. Males were accommodated in one wing and females in the other. The site location and layout are shown on the OS map of 1897 below. The three small structures at the north-west of the poorhouse are thought to be worksheds, where stonebreaking and bone-crushing were performed. 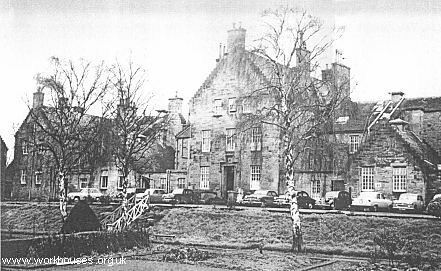 Linlithgow was one of the first poorhouses to introduce a labour-test scheme where a certain amount of work was required from each able-bodied inmate before food and accommodation could be claimed. It was reckoned that upwards of 300 tons of road-metal a year was produced from the sheds even though only five or six men were at work there. In 1932, the poorhouse joined with the adjacent infectious diseases hospital, built around 1900, to form St Michael's Home and Hospital. In 1946, the Home had 90 inmates includinding some mental patients of the 'quiet type'. In 1948, the hospital joined the National Health Service as part of the Bangour Group. Linlithgow from the north-west, c.1956. The building was demolished in 1969 and the site is now occupied by St Michael's Day Hospital. West Lothian Archives, 9 Dunlop Square, Deans Industrial Estate, Livingston EH54 8SB. Holdings include: Linlithgow Parochial Board minutes (1856-1895); Linlithgow Parish Council minutes (1895-1930); Linlithgow Parochial Board House Committee minutes (1851-61); etc. West Lothian Local History Library (2006) Linlithgow Combination Poorhouse — copies available (£2.75 including p&p) from West Lothian Archives, 9 Dunlop Square, Deans Industrial Estate, Livingston EH54 8SB. Levitt, Ian (1988) Government and Social Conditions in Scotland 1845-1919 . Scottish History Society.